Lisa Gabrielson, SOC/BA ’13, and Charlie McCurdy SPA/BA ’13, might be tying the knot this December in Rhode Island (congrats! 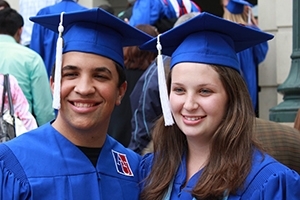 ), but like over 2,500 other American University alumni couples – their journey together began at AU. We talked to Lisa and Charlie as part of our AU Sweethearts Social Media project. For the fourth year in a row, we are collecting and sharing stories of couples who met at AU. Through Facebook comments, tweets, and submissions to our website, we have heard many wonderful stories, and we will continue to showcase AU couples throughout the month of February. You can fill out this questionnaire, tell your story (include a photo!) on our Facebook wall, or share stories and photos on Twitter and Instagram using #AUSweethearts. Describe how you met and your first impressions of each other. Lisa: We ran into each other a lot in McDowell freshman year (he lived the floor below me), but I don't think Charlie remembers. We really met during a study group in the library! I actually wanted to set him up with a friend, but it didn't work out and we ended up together. Lisa: We went to the Zoo! They just had a new litter of baby lions and we went to go visit. I don't remember much detail about the day (5 1/2 years ago!) but it was COLD. Charlie: Our first real date was to the National Zoo. It was November and a bit chilly but it was one of the most fun days I've had in DC. What is your favorite AU memory together? Charlie: Hanging out on the quad on the first nice days of spring sophomore and junior year. that time happened at airports! yes I asked "are you sure?" And took the box out of my pocket! Lisa: We're getting married in Newport, RI where we now live, in December of this year! Charlie: You know you're an AU couple when one lives in the Berkshire, and one the Greenbrier, and your windows face each other so you hold up goofy signs and wave across the parking lot.